Beginning seven years ago there was a movement requesting that our denominational leaders consider changing our name away from “Brethren in Christ Church.” The concern was around the term ‘brethren’ and not the ‘in Christ’ part of our name. The term ‘brethren,’ for one, felt out-of-date and did not translate well in our current culture. But more importantly, the term ‘brethren’ was incongruent with our denomination in that we hold to an egalitarian view of the Bible. Egalitarian is a term that simply means that men and women are equal in all aspects of life including church ministry and service. Therefore, many were increasingly uncomfortable with the term ‘brethren’ being part of our name because it did not support an important value related to the equality of women. Originally, the term ‘Brethren’ was to used to communicate the value of community but that understanding of the term required a certain level of Christian knowledge in order to appreciate the inclusive intent of the language. We recognize that in our world there are many people who do not have the religious background to allow them to interpret our name as an inclusive term. In fact, it is most likely that an unchurched person might conclude quite the opposite. As well, the term ‘Brethren’ caused people to confuse us with other groups that had a very similar name for their denomination. In sum, the term ‘brethren’ resulted in barriers to the gospel that many people were interested in removing. There is a terrific FAQ here if you would like to learn more about the reasons for the name change. Not many denominations would have the courage or would be missionally-minded enough to actually change their name … but we did it. I love being part of a group with that kind of courage and concern for the people who have yet to embrace the good news of the gospel. That is the Be In Christ church family and that is one of the many things I love about it. The official announcement from the Executive Director of our denomination is here. 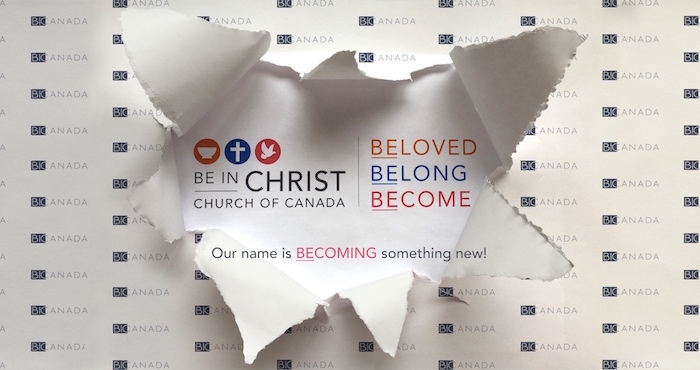 Be In Christ – Name Introduction (AGM 2017) from BIC Canada on Vimeo.